"She was hired to manage the decline." I heard those words over a year ago and they have haunted me ever since. I have lived a life where advance, growth, opportunity, were the words used to describe the next idea, product or ministry. I was hired once to turn a money-losing summer day camp around and within 2 summers we had tripled the enrollment and had enough profit to cause an internal fight on how to spend the excess cash. But I could never imagine being told to manage the decline. But the more I learn about people, businesses and ministry, the more I people who are managing the inevitable death of their organizations, product lines or even entire industries the best they can. These are not lazy or bad people. While some are smart enough to know that the end is inevitable, they are either powerless to change it or don't have the willpower to pay the price it takes to make the shift towards something new. Remember the typesetters of years ago? 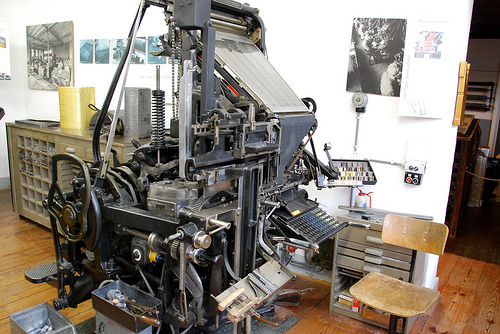 These were massive machines where fonts were created our of metal and wood and loaded as a specialized typist created plates for the printing press. Once the personal computer hit the market, the days of the typesetter machine manufactures, typists, film developers, maintenance workers were numbered. Overnight, and entire industry disappeared. Someone managed that decline. Knowing the end was near, but holding down the fort because it was his job to do it. I side with the old poet Dylan Thomas as he cried: Do not go gentle into that good night. . . Rage, rage against the dying of the light. So I rage. I refuse to believe I'm done. I still want to learn, to grow, to run faster to work smarter, to meet new people and to dream new dreams. While I often congratulate my team on accomplishing so much, I push them toward doing what's going to make us great tomorrow. Today's celebration was yesterday's victory, but we still must win tomorrow's. Please don't ask me to manage the decline or to maintain the status quo. I'm not that guy. I just can't do it. I once remember trying to do it. It lasted less than a month: "We either grow or I'll get fired trying." I left less than a year later on my own but there were a lot of people happy to see me go. Have you ever been put in a position that you knew you were managing the decline?